The Trump Reset Tsunami waves continue to wash that which has been built up over the past 40 years away in a manifestation of extreme delirium which I covered both in the run up to the US presidential election of why Trump would WIN, and in my post Trump analysis of why the Trump Reset looks set to culminate in a war with China. However, immersed in the Trump Reset is the high probability that Trump won't see out his full four year term in office! 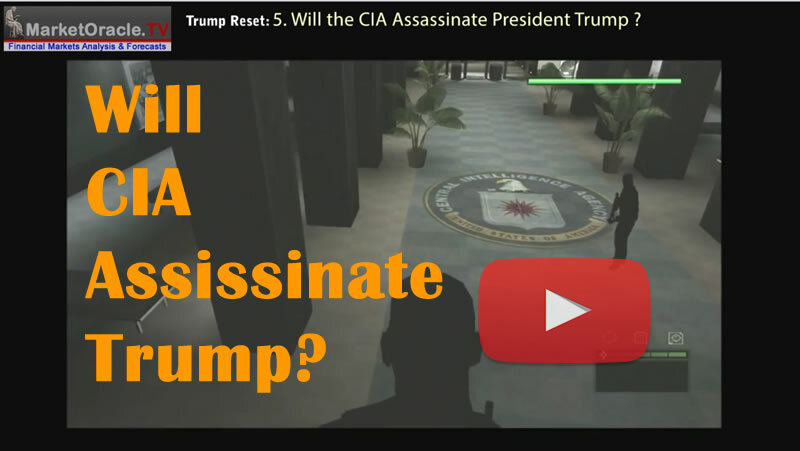 My following video analysis in the Trump Reset series gave various scenarios of how the CIA was planning on getting rid of the 'rogue president'. Whilst my forecast concluded that Trump will probably be ejected from office between June 2019 and December 2019 i.e. between 2.5 and 3 years into his Presidency, still more than enough time to do a lot of damage to the world created during the past 40 years! For the past couple of weeks Trump has done everything like clockwork to reinforce the trend towards the Termination of the Trump Presidency! 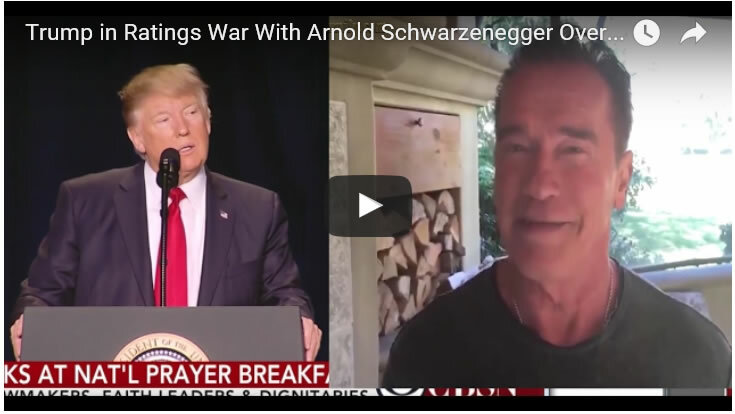 Even Arnold the terminator recently chimed in to offer to replace him so Trump can go back to that which is most important to him, fronting the celebrity apprentice. I recall immediately following Trump's victory my many muslims friends living in the US deluded themselves into thinking that Trump won't be as bad as was implied during the election camp. I tried my best to shake them out of their delusion by stating that he will likely be much worse, for the Trump Resets war witch China demands CONSCRIPTION! Thus like lemmings they were blinding walking towards a defacto apocalypse for many american families regardless of race or religion. THIS SHOULD BE THE MESSAGE FROM MY TRUMP RESET SERIES of articles and videos. AN APOCALYPSE OF SORTS is forthcoming. Anyway I am digress from the primary purpose of this article which is for WHEN Darth Trump Leaves office? My forecast is for a Trump exit between June 2019 and December 2019. It maybe by legal means or a covert CIA operation in which case console yourselves for Donald J Trump is no John F Kennedy! The more I read and watch of JFK the more impressed I am that the United States could produce such a President! Instead DJT is the EXACT opposite of JFK! Still the nature of democracy is such that elections can from time to time throw up both the WORST and the BEST of America, whilst most in the meantime tend to be mediocre Obama's or Bushes. But once every 50 years or so along comes a Kennedy or Trump. So what's the current market price for and end to the Trump Presidency ? a. This is a gamble, it's a bet on that which has very little data to go on. For there are no polls or anything, it's purely throwing the Trump Reset analysis into the mists of time to come up with a best guess. b. That it is a loooong time until the end of 2019, very long time, which means a lot can happen between now and then that could bring the date closer or push it further out, which means the odds could improve a lot, especially if the Iron Man Trump experiences a medical problem courtesy of the CIA during 2019! Though there is an even more risky alternative which is to UNDERWRITE 2019! Yes this would be very risky, and well there's 11 months to go ! So still a lot could happen but for £10 return you would be offering to risk £50 if Trump left office during 2019. For traders out there it's like writing options, and the risk vs reward is pretty poor. BUT that's because the betting markets deem the probability of Trump leaving this side of 2020 as being VERY LOW! Much as the markets saw Trump winning the election as a very low probability! So with 11 months to go, that's £50 risk for a £10 reward for underwriting a NO TRUMP EXIT during 2019. I am tempted to place a small bet in this direction, very small, i.e. I am not going to risk more than £200, for just a £40 return. It's not much compared to the Trump election bonanza. But for those who understand the risk and are eager for a position so as to continue to have an incentive to engage ones synapses in Trumps direction than this could be it for an out right trade on Trump SURIVIVING at least for this year, it's the only near term bet that I can see worth doing because I don't really want lock up a bet on a Trump exit that could be near 3 years down the road! So that's where the betting markets stand a couple of weeks into the Trump Reset Presidency. 06 Feb 17, 15:56 Trump Hysteria! Do you not think you are in danger of lapsing into a little Trump hysteria of your own Nadeem? Relax, there will be no war with China, at least not in the next 5 years. Regards. Sorry Nadeem, but isn't it 1 year and 11 months until 2019? My forecast is for betwene June 2019 and Dec 2019 thats approx 2.5 to 3 years. Nope, I recall when I warned that Russia was going to annex large chunks of Ukraine, that some commented that Russians and Ukrainians were brothers and that it was never happen! Hi Nadeem, Your December Gold and Silver analysis has been working out very well. Kindly request you to provide your analysis on GDX and GDXJ. Thanks!